China Southern , the country’s largest airline by fleet size, expects its net profit to have more than doubled in 2015 due to increased overseas travel by the Chinese, weak oil prices and lower forex losses as the yuan depreciated. Chinese airlines, such as Air China , China Southern and Spring Airlines, have given positive guidance on profit this week ahead of final annual results due to be announced in March. 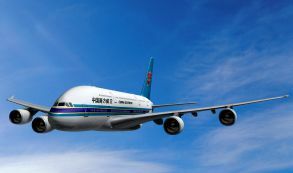 China Southern Airlines Co Ltd expects its net profit to rise by between 110-130 percent in 2015 from 1.77 billion yuan ($268.9 million) a year ago, it said in a filing to the Hong Kong stock exchange on Tuesday. A rise in outbound tourism helped boost its business on international routes, while a fall in jet fuel prices reduced overall costs, the airline said. “The company took the initiative to deal with the sharp depreciation of renminbi and substantially reduced debt ratio denominated in U.S. dollars, (and) therefore reduced the exchange losses from the depreciation of renminbi,” it said. China’s yuan currency is also known as the renminbi. Earlier on Tuesday, Spring Airlines Co Ltd, China’s largest budget carrier, said it also expected to deliver strong 2015 results, with net profit seen rising 50-60 percent from 884.2 million yuan a year ago.